The BBC reported startling economic equality figures in a recent documentary: the top 200 wealthiest people in the world control more wealth than the bottom 4 billion. But what is more striking to many is a close look at the economic inequality in the homeland of the "American Dream." The United States is the most economically stratified society in the western world. As THE WALL STREET JOURNAL reported, a recent study found that the top .01% or 14,000 American families hold 22.2% of wealth  the bottom 90%, or over 133 million families, just 4% of the nation's wealth. Additional studies narrow the focus: This from the Pew Foundation and THE NEW YORK TIMES: "The chance that children of the poor or middle class will climb up the income ladder, has not changed significantly over the last three decades. "This from THE ECONOMIST'S special report, "Inequality in America:" "The fruits of productivity gains have been skewed towards the highest earners, and towards companies, whose profits have reached record levels as a share of GDP." Bill Moyers interviews NEW YORK TIMES investigative reporter and Pulitzer Prize-winner David Cay Johnston who says America's system has been rigged to benefit the super-rich. Investment industry giant John Bogle says that as more and more money managers take control over corporations on Wall Street, Main Street is paying the price. "After 2000 most people lost ground, but, by many measures, those in the middle of the skills and education ladder have been hit relatively harder than those at the bottom. People who had some college experience, but no degree, fared worse than high-school dropouts." "Higher Education Gap May Slow Economic Mobility,"
"The chance that children of the poor or middle class will climb up the income ladder, has not changed significantly over the last three decades." COLUMBIA JOURNALISM REVIEW, Dean Starkman, June 11, 2008. Among the statistical studies reviewed is one published in THE WALL STREET JOURNAL, which found that the top .01% or 14,000 American families hold 22.2% of wealth  the bottom 90%, or over 133 million families, just 4% of the nation's wealth. "The Rich Get Richer," AMERICAN CONSERVATIVE MAGAZINE, James Kurth, James Kurth. "According to the Congressional Budget Office, from 1979 to 2001, the after-tax income of the top 1 percent of U.S. households soared 139 percent, while the income of the middle fifth rose only 17 percent and the income of the poorest fifth climbed just 9 percent. Last year American CEOs earned 262 times the average wage of their workers�up tenfold from 1970." "Poor Prospects," THE ECONOMIST, Oct. 7, 2004. "Over the past 30 years, most of the increase in America's wealth has accrued to those who need it least. In 2003 the top 5% of households took 21.4% of the income, up from 16.6% in 1973. A survey for Time/CNN in 2000 showed that 19% of Americans believed they were in the top 1% of earners." Read the complete text of Twain and Warner's scathing indictment of wealth and politics. By the time she she'd made her debut in 1895, the entire country knew she possessed $20 million -- a sum equal to almost $4 billion today. But that money placed Consuelo in a sort of golden coffin. DEMOCRACY: A NOVEL Henry Adams, 1880. This classic novel of political power in the Gilded Age was published anonymously by Presidential grandson and great-grandson Henry Adams. The George Eastman House has dozens of Lewis Hine's photos from Ellis Island and working-class New York at the turn of the century. 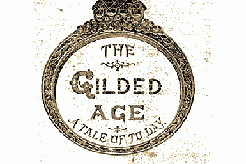 View the complete text and illustrations of Riis's ground-breaking study of the Gilded Age poor in New York. Senator Bernie Sanders, "The Collapse of the Middle Class"
Senator Sanders' office received over 600 responses from all across the state, as well as some from other states. This small booklet contains a few of those letters.